Story: I was having fun with a blown H4 lamp (blown as in the main filament was blown but the high beam filament was still intact), so i decided to power up the high beam filament on my variable PSU. It was going ok up until it went over 20 volts, i'm not sure what happened but the lamp started flashing light blue and pink for about a second and then it exploded (and it was pretty loud too). It's possible that when the filament melted it fell onto the quartz envelope, then the stress from the localized heating caused it to crack then explode. You could of established an arc and blew up the bulb with over heating. I like to put twelve volt automotive bulbs on my 1000 watt HPS ballast and the filament almost always immediately blows followed by the establishment of a blueish green arc that turns pink and orange then the bulb pops violently with a sparky explosion. @LandryB: It seems possible that a piece of melted filament fell on the glass cracking it and making it explode. However, it does not explain the light blue and pink colors it started alternating between before exploding. @HomeBrewLamps: That might explain the alternating colors but i'm not sure if an arc would form at such a low voltage (about 22 to 24 volts), but maybe the gases in the bulb lower the arc voltage that low (and the filament looks like it may have suffered arcing). It definitely started to arc. Does the poewr supply have a current limit? The power supply was able to output a full 10A into it's load. 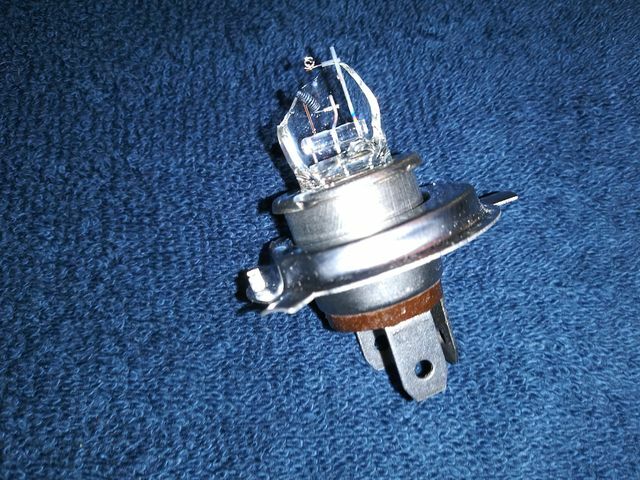 And i knew it started arcing because about a month ago, i did the same test with another headlight bulb and while it did not explode, i could tell it had started arcing. There is a 24V version for trucks and buses. Same form factor but iirc higher power ratings (70-ish W instead of the usual 55/60). Wouldn't that version tend to arc and explode at normal EOL ? Must be something to do with a combination of the fill pressure and proximity of the hot filament....particularly if it is over driven. Normally the presence of halogens...often as compounds like methyl bromide, or hydrogen iodide, or even just molecular bromine or iodine tends to quench the tendency to arc because energy is sapped away by both the dissociating of these molecular species into free atoms and the ability of molecules to spin, rotate and vibrate, which free atoms don't possess. I reckon the filament was so hot, and the vapor pressure of tungsten so high, that the inner part of the halogen cycle, (that zone near the filament where everything is dissociated into atoms by the heat) extended a significant way, or possibly all the way to the bulb wall. Arcing through this "soup" of free atomic species would have raised its temperature significantly...and we all know "PV = nRT" and what happens next! Since V, n and R are fixed, then P is proportional to T...and POP! I reckon the 24v models have a different cold fill gas mix and pressure and possibly halide species too. You know those DJH GLS Retrofits... their capsules contain a real "soup" of compounds, Xenon, Phosphine, Silane and Dibromomethane ...so I reckon these Automotive ones would too...tailored to their needs and conditions.